Title: Happiness Is A Warm Alien! 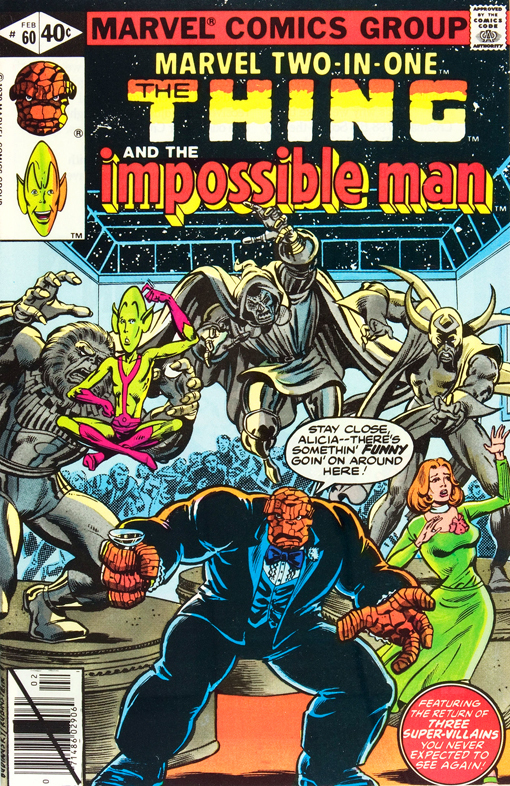 Synopsis: As the Thing prepares for the opening night of Alicia Masters' sculpture exhibition, the Impossible Man makes a surprise visit to the Baxter Building. Ben begrudgingly allows Impy to come with him on the condition that he transform into a hat and remain a hat for the whole evening. A funny scene follows as the Thing walks to Alicia's apartment dressed up in his tuxedo but with the Impossible Man on his head transforming from one silly hat to the next. Ben and Alicia proceed to the Yates Gallery in SoHo where an incredible double-page spread shows Alica's sculptures of Dr. Doom, Sandman, Diablo, Blaastar, the Wizard and Ultron on display. In a fun breaking of the so-called Third Wall, George Perez, Mark Gruenwald and Ralph Macchio appear as guests at the gallery show. Unbeknownst to the Thing, the caterers at the party are three villains that our hero was responsible for imprisoning. Seeking revenge on the Thing, they transfer their life forces into the sculptures and attack. The Thing doesn't fight back initially because he doesn't want to destroy Alicia's sculptures, but she gives him the word to cut loose and he dispatches two of the stone villains easily. Yogi Dakor in Diablo's stone form grabs Alicia and threatens to crush her, but the Impossible Man saves the day by turning into a water balloon and splashing the villain so that he loses his concentration and control over the statue. Having saved the day, the Impossible Man admires the love that Ben and Alica share, ruing his own loneliness and deciding to change that by creating a mate for himself. A happy ending all around!